Makani Sands # 301 est un coin spacieux 3 chambres, 2 1/2 salle de bain maison de ville sur le coin 3ème et 4ème étage, avec une vue incroyable sur l'océan. Décorée dans un style hawaïen traditionnel, cette belle maison de ville est équipée de 3 télévisions par câble, d'un magnétoscope / lecteur DVD et d'un lecteur CD. Il y a une cuisine complète comprenant une cuisinière conventionnelle et un micro-ondes. Il y a une grande table ronde pour les repas de famille. Passez quelques nuits à la maison à cuisiner du poisson frais sur notre barbecue en bord de mer, ou installez-vous et détendez-vous et passez une journée à bronzer devant. A l'étage il y a un lit king dans la chambre principale sur le côté de l'océan avec une salle de bain privée, et un lit king dans la chambre d'hôtes sur le flanc de la montagne. En bas, il y a une 3ème chambre avec des lits jumeaux. Profitez d'une journée sur notre plage de plongée, nager ou faire du kayak juste devant votre porte! 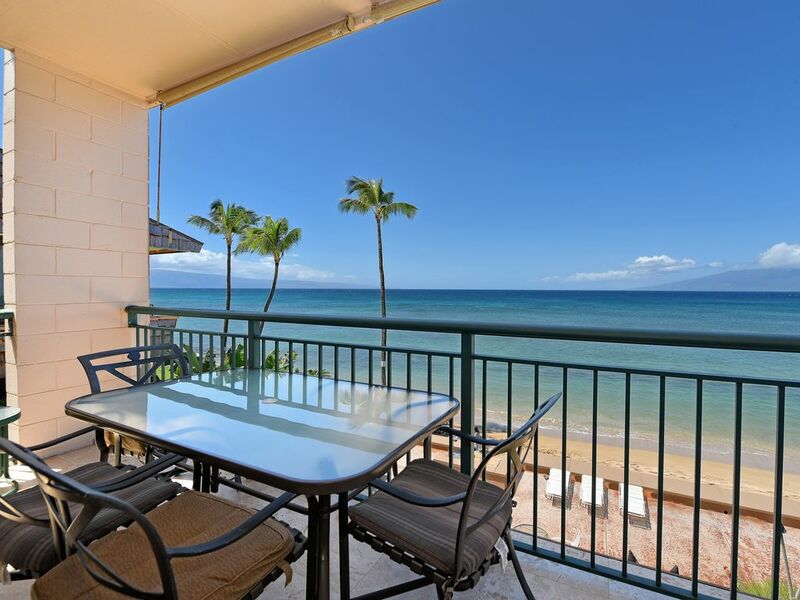 Venez découvrir Maui et rester dans le condo # 301, votre maison loin de la maison sur Maui! We very much enjoyed our stay at Makani Sands. This was our second time staying in unit 301. The unit was very clean and comfortable and the ocean view was spectacular. The management was very helpful and loaned us some beach items, such as chairs and umbrella. Our group consisted of six adults and two babies. There was plenty of space for all of us. My only minor complaint would be the parking area. We had rented a minivan and the parking spots were very tight. I would definitely stay here again. We were so happy at the condo at Makani Sands! The view is absolutely amazing, the place was very clean & perfectly equipped for our stay! We did not want to leaves, but will definitely be back soon!!! Amazing accommodations make for an amazing trip! The property was perfect! We were in room 301 and had 3 adult couples. Very comfortable! The view is great, the beds are comfortable, the AC worked fine, and the staff were very helpful (Marie and Lorne). It was so nice not have to bring bathroom or beach towels, and there was a W/D in the unit, so we could pack lighter. We walked to the farmers and fish markets and board walks, and everything on Maui is within a few hours. If we wanted a night out in Lahaina an Uber/Lyft was only $10-15 one way (for 6 of us!). Thanks for making the trip so great! I hope we can come back some day. Amazing! Oceanfront doesn&#x2019;t get any better. Our stay at Makani Sands was amazing! The vacation rental was in the best location. Oceanfront, walking distance to farmers market, beach walk pathway, grocery and food stores. The condo was clean and in good condition. The vacation rental management staff was very nice and helpful. We will stay here again next year. This unit was great! The location of Makani Sands is amazing, this unit worked perfectly for our family vacation and had everything we needed. We WILL be back!